Welcome to Cheaha Cheer & Tumble! Below are our class listings and availability. After you complete the registration process, we will contact you regarding your start date. Credit/Debit cards ARE required for registration, but we do not charge cards until you start a class and you have selected recurring payment options on the 1st or 10th. If you select the cash/check payment option, you would simply pay by check or cash upon starting your class. Online registration is very user-friendly and takes less than 5 minutes to complete! Feel free to contact us with any questions at info@cheahacheerandtumble.com. Ask about our hero discount offered to those actively serve our communities and country. My girls love Cheaha Cheer and Tumble! The instructors are dedicated and spend time coaching each student, helping them to meet their full potential. 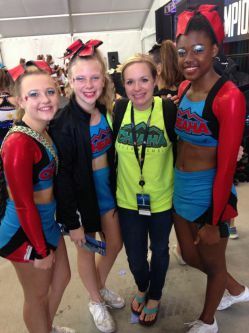 If you're looking for a great place to have your children learn the art of tumbling, the techniques of cheer, and the value of true sportsmanship, all while you as a parent get to see their self-esteem grow each week, then Cheaha Cheer and Tumble is the place for your family! Our local area is blessed to have Allie Mitchell, her husband, and staff here in Calhoun County! © 2019 Cheaha Cheer and Tumble. All Rights Reserved.